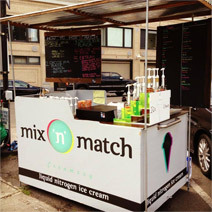 About Mix 'n' Match Creamery Mix 'n' Match Creamery is where science and deliciousness meet. With a blast of liquid nitrogen, kept at a frosty -320°, each order is custom made to your particular flavor request. Forget 32 flavors, at Mix 'n' Match you can create millions of flavor combinations. All created in an entertaining and exciting way, right before your eyes! Start your ice cream adventure today. Mix 'n' Match Creamery. Add an awesome twist to your party! Our delicious liquid nitrogen ice cream & Alcohol-Infused Liquid Nitrogen Ice Cream is sure to be a memorable experience! We do weddings, corporate events, street fairs, parties, and more! Call Eric West at 971.678.5653 or email mixnmatchcreamery@gmail.com for more information and pricing.